We went with a really simple, yet elegant theme for our daughter's room. I found some beautiful bumble bee bedding that was a pale yellow, black and white gingham and had accents of sage green. A friend called and told me about one of the local home decor stores having bee hives for sale. I purchased a large hive and a small hive. They are made with twigs wrapped around and around. They are so simple and sweet. 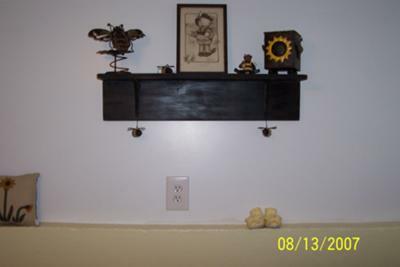 I found a black shelf and we placed that on the wall with a picture that I bought at an auction. The print is call Stung, and it is a 1908 original...frame and all. It's probably my favorite thing in the room! Our changing table is one that my husband used, and his two sister before him. It was made by his father. It's very sentimental to have it. One wall is painted a soft yellow, the rest of the walls are white. I also bought an end table at an auction, stripped the paint and decorated it myself. The legs are black and the top is white with a yellow square, it also has small bee's on the top that I painted. We have quite a few baskets, of natural material. I use one basket for books, and that is placed next to the rocking chair...yet she can dig in anytime she pleases! Another basket is on top of her dresser and hold hairbows and such. I really love this room...it's calm and peaceful. I love the idea of the old print! It's great! I'm also really digging the fact that just because you were having a girl you didn't plaster the room in pink and purple. I think this theme and room would work well for a boy or a girl. It's really beautiful! I'd love to see more pictures of this room. The yellow is calming and not overwhelming at all. The old print is a great touch! I love the old picture that you included in the room! I like the bee theme and that you didn't go with a traditional theme based on your crib bedding.